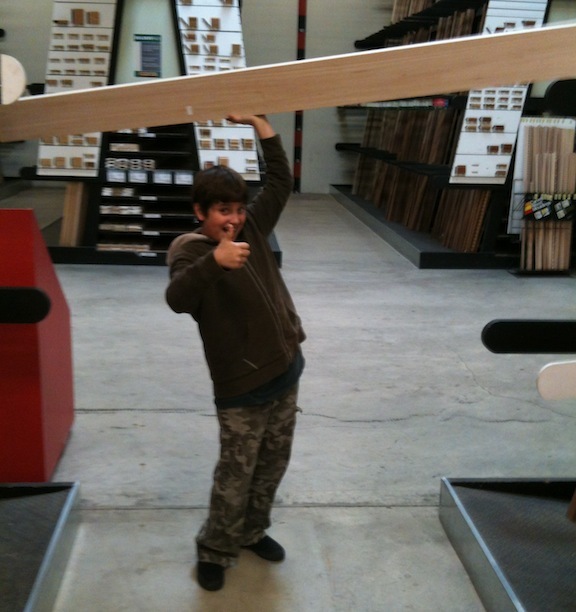 My son and I ran over to Southern Lumber in San Jose this morning to pick up some material for the legs and stretchers. I probably could have gotten this at the lumber yard in town, but they have a nice selection of hardwood and I like to browse. 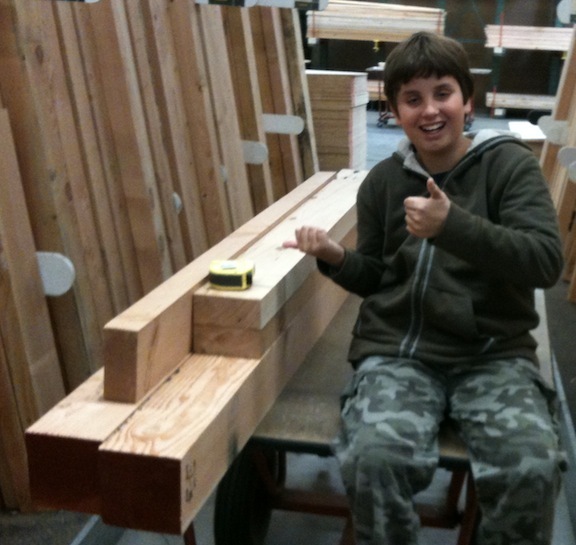 First things first, we picked out two 8′ 6″ x 6″s to make the legs, and a few shorter pieces of 3″ x 6″ for the stretchers. All doug fir. They are green, so I’ll need to rough cut them and let the air dry a bit before I do the joinery. It won’t take much work with the plane to clean those up! Kolya and I browsed through the wood for a while. They had some nice, clear pine in 1″, 5/4 and 8/4, but it seemed pretty expensive. Perfect for building a toolchest, not so good for my budget. Southern Lumber is known for the selection, not low prices I guess. We looked at all sorts of tropical exotics, Kolya was really surprised at the weight of the ebony planks. I was shocked at the price (about $100/bf). In the next aisle they had some 4″ x 6″ balsa boards. I had him try to lift one of those. I also got some quality time with my saws and have the bench top sized up, I’ll post some pictures tomorrow.